The WUK (Werkstätten- Und Kulturhaus) is an alternative, leftish-arty culture and workshop space in the 9th district of Vienna, Alsergrund. Since Alsergrund is home to the Vienna University and the Medical University, it is a rather studenty district and the WUK makes an attractive meeting point for young people. It is situated in a 19th century locomotive factory. Previously, there was a museum (Technologisches Gewerbemuseum) situated in the WUK, but it moved to the 20th district and in 1981, the current cluster of alternative organisations moved in as what now turned into the WUK. Today, the WUK consists of 12,000 square metres that house rehearsal rooms (used by theatre groups, students and local bands), two "free" schools, event venues, a café and bistro, exhibition rooms - and workshops, mostly used for fixing bicycles. Every year, there are about 300 events that take place in the WUK that draw a total of 500,000 visitors to the WUK. I generally like the atmosphere there once in a while, the WUK can be particularly nice on a warm summer evening when people sit outside in a relaxed manner. 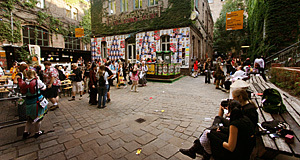 The WUK was started by the "Verein zur Schaffung offener Kultur- und Werkstättenhäuser" (Society for the Creation of open Culture- and Workshopspace), which fist became active with festivals in a public park in 1979. The WUK is organised in a de-central, "autonomous" manner with 130 groups that use the facilities and who are organised into seven chapters. There are dance groups, children groups, groups for elderly people, art performances and fine arts - to name but a few. In addition, there are social projects like one that aims to integrate unemployed teenagers into a regular work environment. The society behind the WUK describes the "idea" or essence of the project as such (my translation): "The WUK idea means primarily the socio-political experiment of the WUK, as well as the work and intentions of the society behind it. Furthermore, the WUK idea extends to all the activities that are involved with the socio-political aims of the house, as well as initiatives that actively stand in for their underlying ideals, work on them and push them forward." Everything clear? Well, most things at the WUK are not very sharply defined. Miraculously, it seems to work very well for almost 30 years now. In this respect, the WUK is a bit like India, I guess. I suggest you to simply try it out at some point - have a beer, go to a concert, fix your bicycle. The WUK is a funny, but friendly place and warmly recommended. Attractions nearby include the Volksoper Opera, the Liechtenstein Museum, the Altes AKH, the Strudelhofstiege and the Josephinum. With a bit of a walk (or the tram link), you get to Berggasse with the Freud Museum, and to the Votivkirche with the Ringstraße and its many delights.